Thrilled to be shortlisted for the Asian Writer Short Story Award 2012. 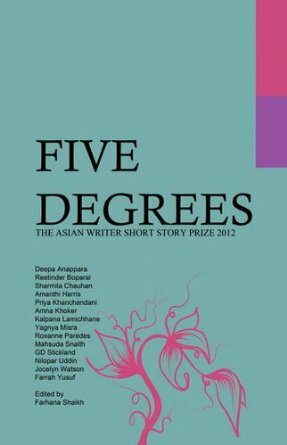 My story Oysters was featured in 5 Degrees anthology and read at the launch event at Bush Theatre! The restaurant was a nice Italian on Poland Street. The type that got popular by word of mouth. She wore a pink dress, with thin straps and a flared skirt. He was pleased to see her face still had the same plumpness around the cheeks. The same darting eyes and ready smile. He could tell she was interested by the way she watched his mouth. She took his hand. Her fingers were small and cold, holding his palm out flat; tracing the lines. She pressed and prodded, making approving noises. “So?” He asked, gazing at the haphazard curve of her parting and a stray grey hair the straddled between the black. She smiled and closed his hand into a fist. She laughed; soft and escalating, asking him to join in. A glass of red wine swirled in her hand. She held it out to him. He watched the liquid cling to the sides and then took a large gulp. They talked easily. Tumbling into conversations and then stumbling out to find they’d lost their way. Turning back, to try again. Their sentences long and winding, sometimes with no real purpose, than to feel the slow burn of the other’s full attention. He looked around. Searching. Perhaps this was a test, and Maya would pop out of somewhere and surprise him. Then berate him. Sheena’s knees touched his under the table. She ordered oysters, not bothering to ask if he wanted them or not. When they arrived; fresh and salty, he was the first to pour one into his mouth.